A Proper Historical Romance series! Based on the true romance of poet Henry Longfellow who was madly in love with Fanny Appleton and devotedly courted her for seven years until finally winning her over. Includes notes, excerpts from Longfellow's poems and discussion group questions. I loved this book! 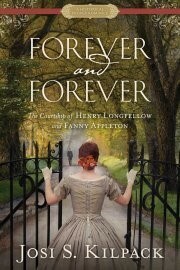 Josi Kilpack did an amazing job of weaving together truth and fiction to bring to life this tender romance between poet Henry Longfellow and his wife, Fanny Appleton. It is a tale of passion, unrequited love, growth, loss, and in the end, a love worth waiting for. I found myself trying to guess which parts were real and which were fiction. When I read the notes at the back, I was surprised to find many of the strange events were facts! Thanks to Kilpack’s careful research, Henry and Fanny’s story comes to life. Fanny and Henry meet at a tragic time in both their lives. Henry has lost his wife, and Fanny is about lose another member of her family to consumption. There new friendship blossoms as Henry shows a great compassion for the Appleton’s loss and, in turn, the Appletons’ friendship and joy for life bring Henry out of his own darkness. Circumstances require that Henry part from his new friends, but upon their return to Massachusetts, he eagerly renews his acquaintance with the prosperous Appleton family, especially Fanny. He’s positive after their many delightful conversation that Fanny can’t help but feel the same fervor of feelings that have infused his life with new energy. For her part, Fanny is not impressed. Their age difference, social status, and her desire to leave her heart untethered to prevent further heartbreak all lead her to reject his unsatisfactory proposal. The next few years bring one change after another for her, and much embarrassment for Henry’s sudden return to writing that casts her in a bad light. Through many ups and downs, and after everyone arounds her finds their own joy, she slowly comes to listen to her heart and dares to reach for true happiness for herself. The timeline spans seven years, from right before Fanny and Henry meet to when they finally accept their feelings for each other, it didn’t drag in any way despite the slow progress of the actual love story. Both Henry’s and Fanny’s characters had such depth that is felt natural to go through the struggles they faced with each other, and in other areas of their life. I’ll admit it piqued my interest, and I'm eager to research more about one of America’s early writers. I love when authors of historical fiction make a note of what really happened - I'm often so surprised! Sounds like a great story. Thanks for sharing!